Today share is a cool box/bag. I name it No Fuss box and you will see in the video (on my blog ) why I gave it this name it’s so easy and quick. What You need is your Simply Score #122334 a piece of DSP 6 x 12 and score on the long way at 1 and 4-1/4 and on the other side score at 1-3/4, 5-1/4, 7 and 10-1/2 and just a few snip and you have your box. The DSP I use for the Christmas one is Candlelight #126901 and the blue one is Fan Fair #126918. Last night was such a fun Margarita, Stampin’ party what a fun group of ladies. So I’m on the run again so my friends this is it for now and I will be back tomorrow with more fun stuff. I have a class tonight so I need to get ready 🙂 Fun stamping with friends. PS Welcome to Lisa F. and Angela on my team. They both join my Fun group of ladies and get 175.00 of stampin’Up! supplies for only 99.00 with FREE Shipping. 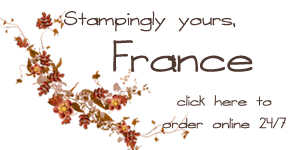 Are you ready to be part of a fun group and a super good deal of stamping supplies. E-mail or call me if you have any question or click the join now on top of my blog if you are ready. I know I’m ready to have YOU on Frenchie Team! Adorable little boxes & bags France! Great for gift giving! I check into your blog every day & always learn something new. Love your videos! You always make it look so easy. I'd love to attend your classes, but coastal Georgia is a bit far from Wyoming – so the videos will have to do. Thank you sooo much! What a quick and easy box/bag perfect for little gifts. Thanks for another fabulous video!